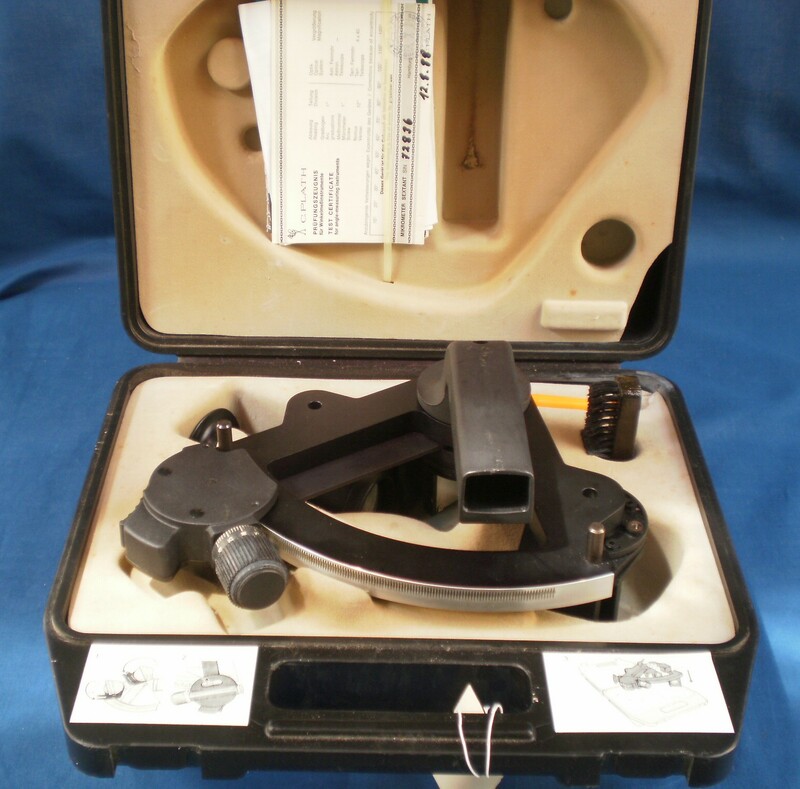 In this post I will be surveying some C Plath sextants in my possession. I have given detailed coverage already to the Plath Dreikreis or three-circle sextant in January 2010 and to a 1953 ladder pattern sextant in December 2011, so I will be only summarizing details of those instruments. 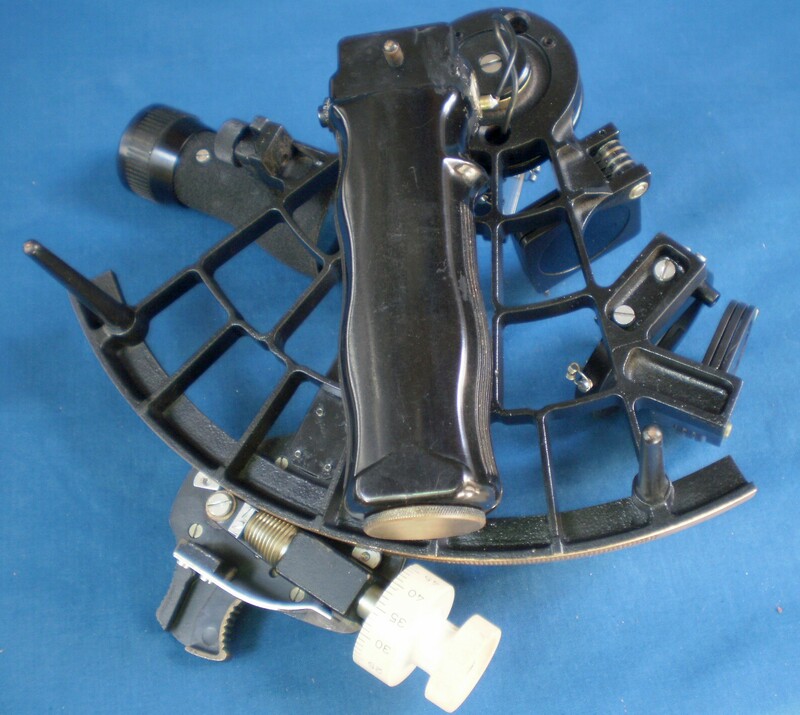 I also looked at Plath’s standard wartime sextant of WWII in the context of detecting fakes in my post of 14 July 2010 and I will give a general overview of that instrument. The last production instrument was Plath’s Navistar Professional and as I have not previously given any cover to that, I will take a detailed look at it. The National Maritime Museum (NMM) at Greenwich has a few Plath nautical sextants and the excellent photographs of the instruments allows one to follow the evolution of the micrometer sextant. 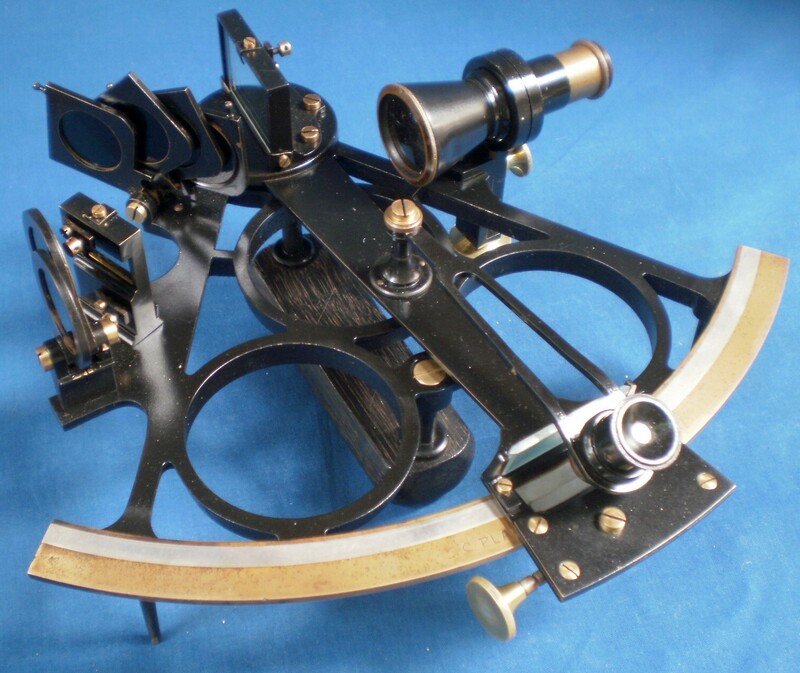 Following this link will take you to their sextant collection: http://collections.rmg.co.uk/collections.html#!csearch;authority=subject-90227;collectionReference=subject-90227;makerFacetLetter=p;makerReference=agent-17323;start=0 ; and I will give the reference numbers to allow more rapid retrieval. Most of the photographs in this post will stand enlarging to 200 percent by right clicking on the figures. Use the back arrow to return. Carl Christian Plath took over the business of David Filby in 1862. Philby was an instrument maker, but just as with clock and chronometer makers, he did not actually make the sextants he sold. However, Plath bought a dividing engine from Repsold in about 1865 and his own first sextants probably date from shortly after that date. As with most early instruments, few of them survive. It seems that they were regarded simply as tools of the trade by their users and most often unsentimentally discarded when their owners retired. No doubt, some were lost at sea and others found their way to attics and basements, only to be thrown out as unidentifiable junk after the owner’s death. The earliest Plath sextant that I have dates from about 1909. 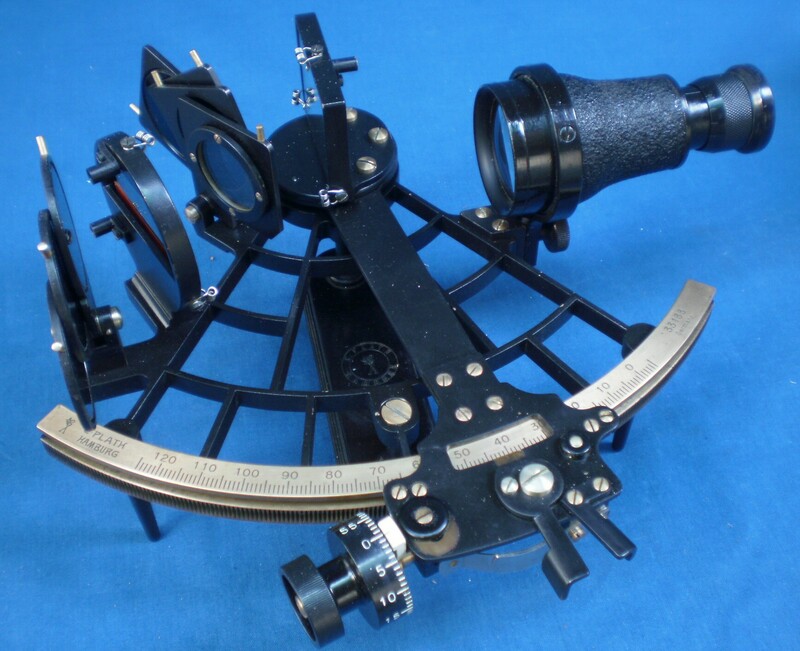 The main interest of the Dreikreis (three circle) sextant, apart from its relative rarity, is in the ribbed three circle frame, also adopted by Heath and Co and Hughes and Son, the two leading makers in Britain. That shown in Figure 1 is a vernier instrument. The sliding block arrangement (Figure 2) is rather more complex than usual and is covered in more detail in my post for 24 January 2010. Around about 1907, Plath began to advertise a micrometer sextant whose mechanism scarcely changed for the remainder of the time that sextants were manufactured. 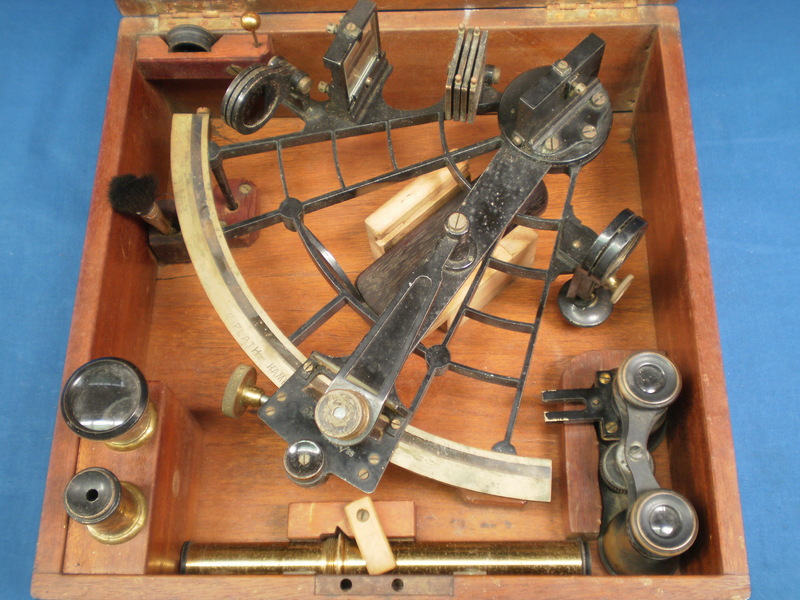 A three circle micrometer sextant by Plath is illustrated in the NMM on line collection, reference NAV1130, and the photographs have sufficient detail to allow one to compare the micrometer mechanism with later ones. Plath were still producing vernier instruments in 1920, the date of the sextants shown in Figure 3, but by then was using a fine adjustment system that was on its way to being a micrometer, in that the “endless tangent screw” operated on a fine rack cut into the back of the limb, as shown in Figure 4. More details will be found in my post of 4 December 2011. 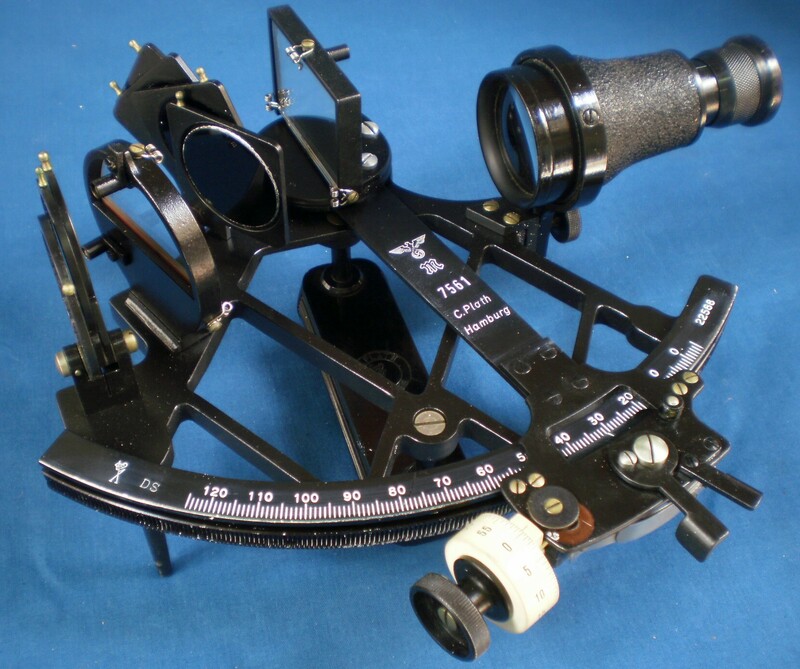 This layout was patented by Heath and Co in 1910 and required only the addition of a micrometer drum and the adoption of a suitable pitch for the rack, which was what Heath and Co did, but Plath had already placed the rack of their micrometer sextant on the edge of the limb and this was the pattern adopted by most other makers. 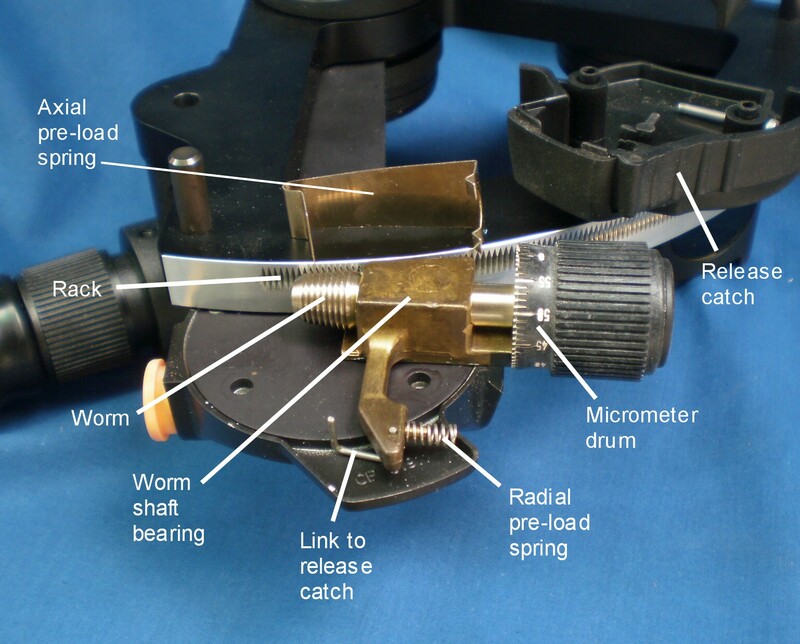 Figure 3: Plath vernier sextant with “endless tangent screw”. 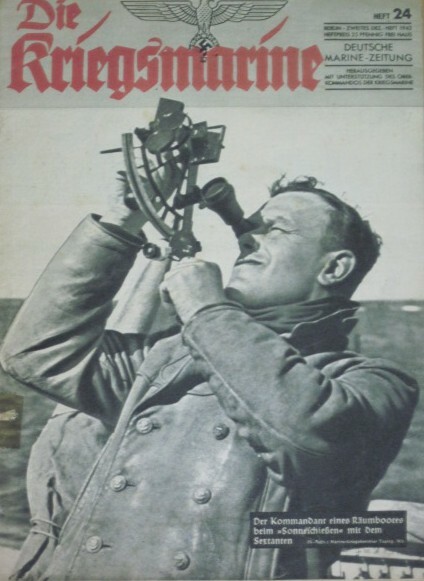 Fig 5: “Die Kriegsmarine” magazine, December 1943. Figure 6: Standard ladder pattern sextant. Figure 7 shows the micrometer mechanism in close-up. The worm is conical so that the end of the shaft that bears the drum is further away from the frame, allowing the use of a larger drum than would have been the case had a cylindrical worm been used. End play in the worm shaft bearings is taken up by the axial preload spring that bears on the rear end of the shaft. A radial pre-load spring keeps the worm in engagement with the rack and a keeper on each end of the expanded lower end of the index arm prevents the mechanism from lifting away from the front of the limb. The worm in its bearings is attached to a swing arm that rotates about a bearing. 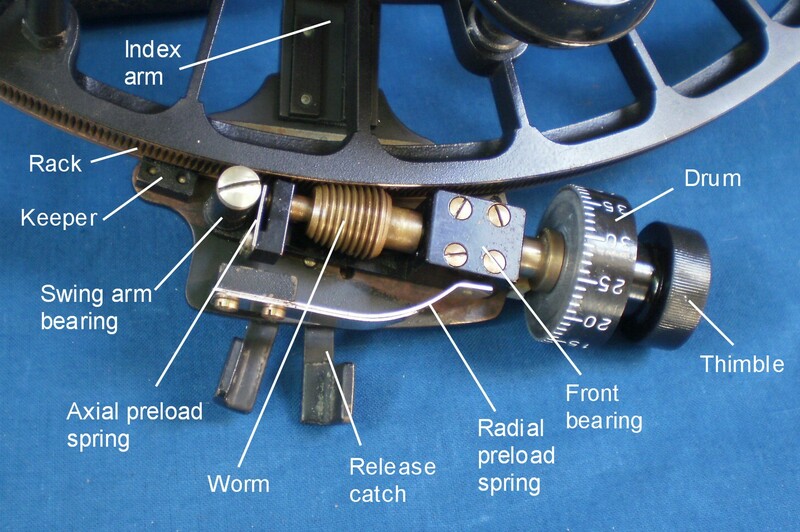 When the release catch is operated, the worm swings out of engagement with the rack in the plane of the sextant frame, allowing the index arm to be swung rapidly to any desired position. 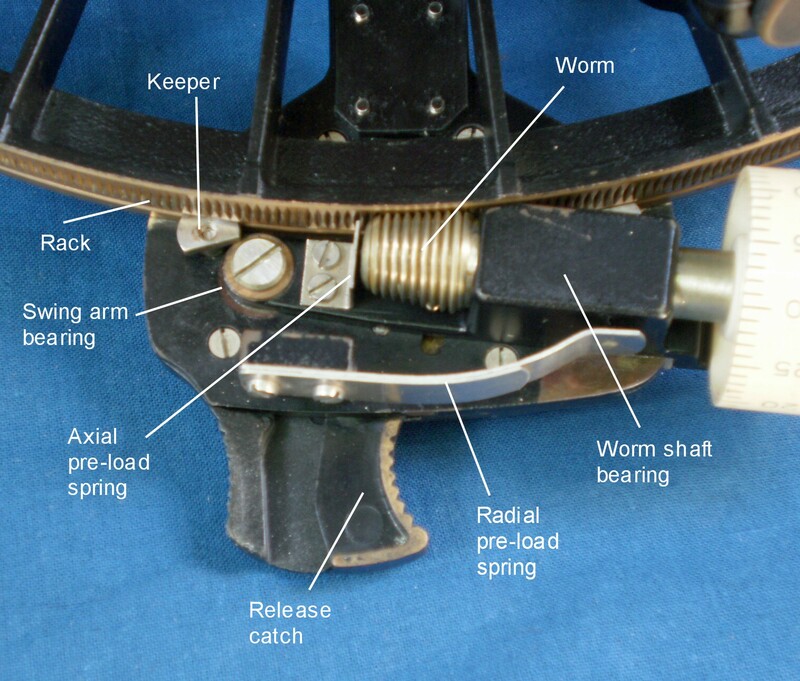 When the catch is released, the worm swings back into engagement with the rack under the influence of the radial pre-load spring, ready for fine adjustments to be made via the worm. As will be seen, this mechanism was later simplified, probably to reduce production costs, before a final burst of simplification in the Navistar Professional model. While the standard sextant had a bronze frame with bronze mirror brackets and weighed with its telescope a hefty 1.9 kg (4.19 lbs), the wartime standard sextant had an aluminium alloy triangulated frame (Figure 8) with alloy brackets weighing a mere 1.2 kg (2.65 lbs). Once the very expensive moulds for the frame and brackets had been made, many thousands of the parts could be turned out rapidly by the pressure die-casting process; and the serial numbers increased by about 4,500 between mid 1942 and the end of the war in mid 1945. While aluminium alloy frames were perceived to be inferior to bronze ones by mariners, in fact they are rather more rigid and stable and at least as corrosion resistant. 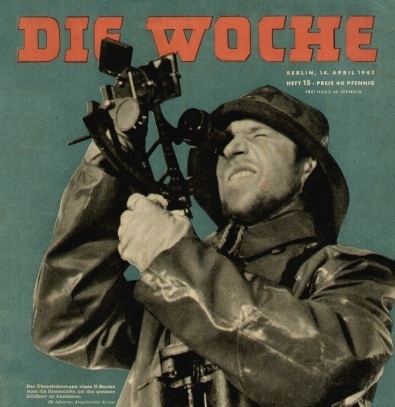 Figure 9 shows the instrument in use during wartime as illustrated by the magazine Die Woche for 14th April 1943. 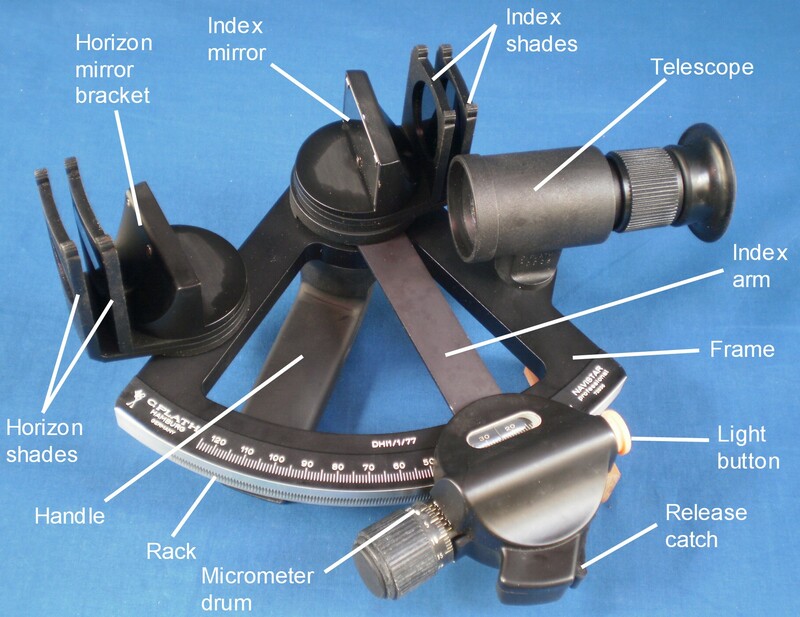 The 0.7 kg reduction in weight makes using this model of sextant a pleasure and it has not been my experience that a lighter sextant is more difficult to use when there is a strong wind. Figure 9: Sextant in use during WWII (1943). 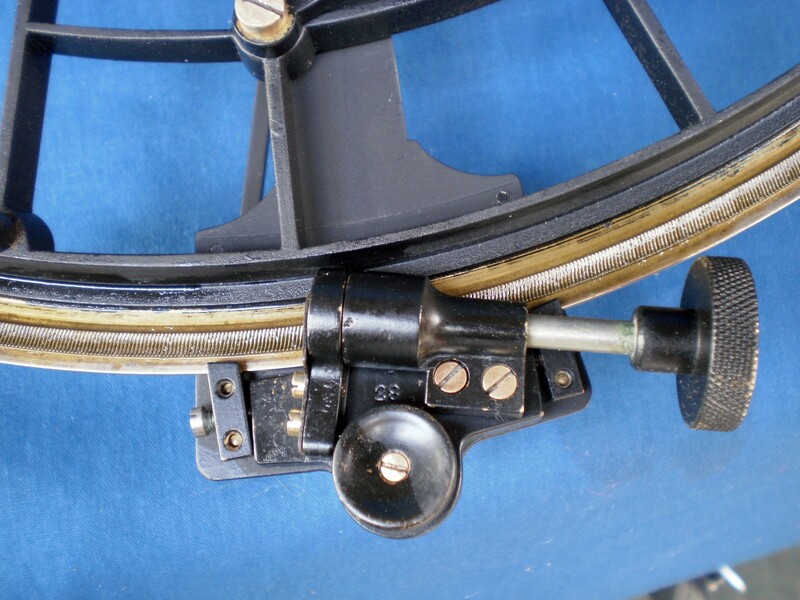 As noted above, when Plath resumed sextant manufacture in the early 1950s, they produced their standard pattern bronze-framed instrument, but by 1975, while retaining the ladder pattern, it was slightly better designed with sharp corners eliminated. I give a general view of the front of this “Navistar” sextant in Figure 10 of this post. A battery handle with scale illumination via light guides had been added and the handle was canted at a more ergonomic angle. The mirror brackets and shade frames were now of aluminium alloy and the classical tapered index arm bearing was replaced by a plain parallel one of white metal running directly in the frame. Its weight with batteries remained about the same at 1.9 kg. 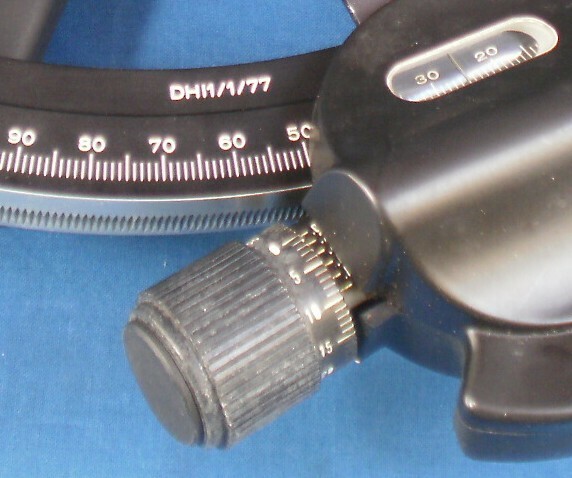 The telescope in older instruments can be dismantled for cleaning or drying out, but in the newer instruments, the objective lens was glued into place in the telescope body and the eye lens was glued into the plastic eyepiece, making any servicing rather problematic. Figure 11 of my post of 18 December 2010 shows how problematic it can be. 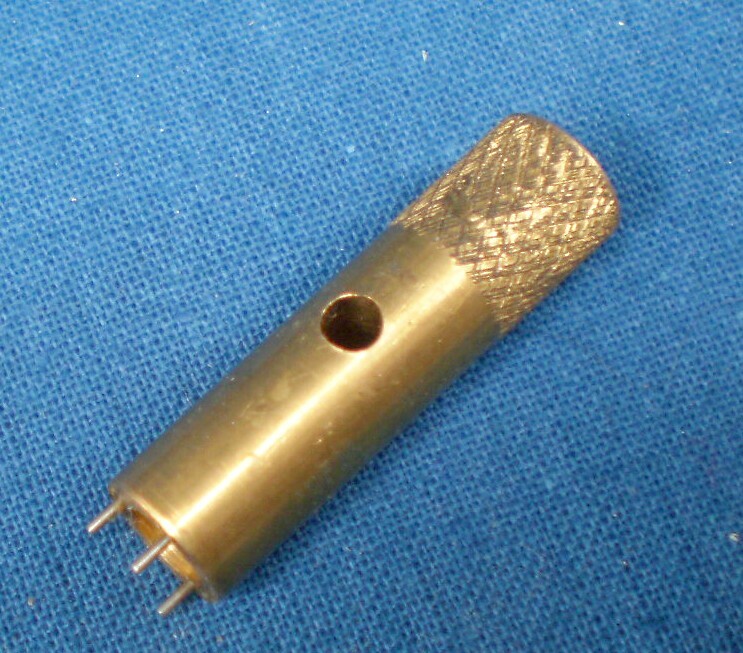 The shades were retained by a non-standard nut requiring a special tool (Figure 11 of this post) to tighten it if the shade friction was insufficient. Such a tool cannot be bought, so any one wishing to dis-assemble the shades for cleaning and greasing had to make one of their own. There was no question of simply sending the shades assembly to the makers for adjustment, as the bracket was now part of the frame (Figure 12), rather than being attached with screws as previously, so the whole instrument had to be sent.. It appeared as though a sextant too expensive to throw away had been made for a throw-away age. Figure 11: Non-standard pin wrench to adjust shades friction. Figure 13 gives details of the micrometer, from which it can be seen that its manufacture had been considereably simplified without, one hopes, sacrificing quality. While the release catch itself was an alloy die casting, the fixed part of the release catch was an extension of the plastic of the light guide and was easily broken off. 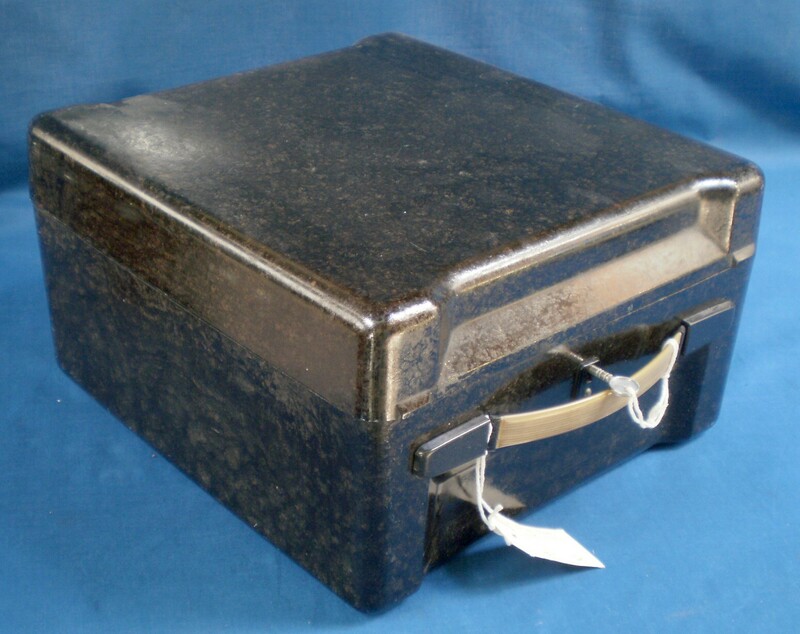 These instruments were no longer supplied in mahogany cases like pre-war sextants, but in heavy, moulded, black bakelite cases with various retention systems that did not always survive heavy handling, though the cases themselves are almost indestructable (Figures 14 and 15). 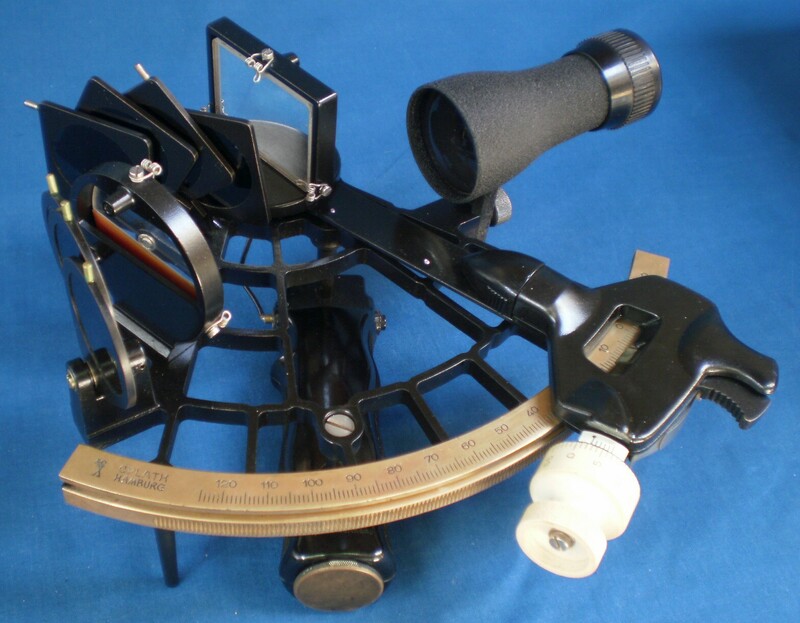 In 1977, Plath introduced their Navistar professional sextant, just in time for it to be made obsolete withn a few years by the advent of the Global Positioning System. The frame was a hefty triangle of aluminium alloy 14 mm (0.55 in) thick. While this undoubtedly made it cheaper to manufacture, it had the unfortunate corollary that there was nothing by means of which one could pick it up, except for the handle, so it was provided with a light moulded plastic case in which it sat handle uppermost. This led to a further difficulty: because it was not provided with legs, this is the only place that it can be put down and then only with the index set at – 6 degrees. Figure 16 shows a front view of the instrument and Figure 17 shows it in its case. What appear to be stubby legs on the rear of the limb serve only to act as stops for the index arm. Figure 16: Front view of Navistar Professional sextant. Figure 17: Navistar Professional in its case, rear view. Extensive use was made of high-impact moulded plastic, in the handle, the telescope body, the shades mountings. the lower end of the index arm and release catch and the micrometer drum. The latter was a mere 15 mm (0.6 ins) in diameter with figures of a size to tax aging long-sighted eyes (Figure 18). The same slightly inadequate drum was used in the Plath Navistar “Traditional” in which the frame took the form shown in Figure 10. 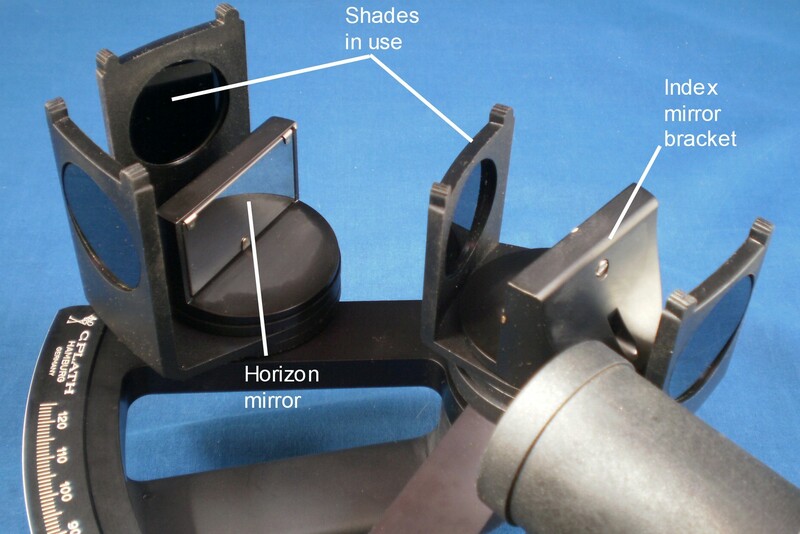 The shades, two each for the horizon and index mirrors, were mounted so that they rotated around their mirrors (Figure 19). They are easy to use, but if the sextant is placed carelessly on a flat surface face downwards it is the shades that will suffer. The two mirrors were identical so only one size was needed for replacement, but because the horizon is viewed directly rather than through glass as in a traditional full glass horizon mirror, overlap of images is rather limited. The mirrors were first surface with overcoating. Figure 18: Micrometer drum and arc. Figure 19: Horizon and index shades. 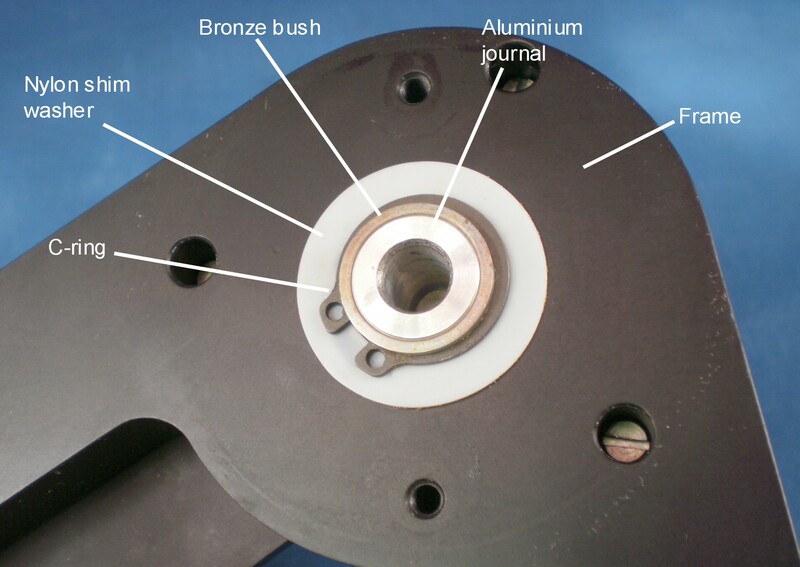 The index arm journal took the form of a bronze bush surrounding a boss extending from the bottom of the index mirror bracket and the bronze-coated journal ran directly in the frame, being secured by means of a C-ring and a nylon washer (Figure 20). Figure 20: Index arm bearing. 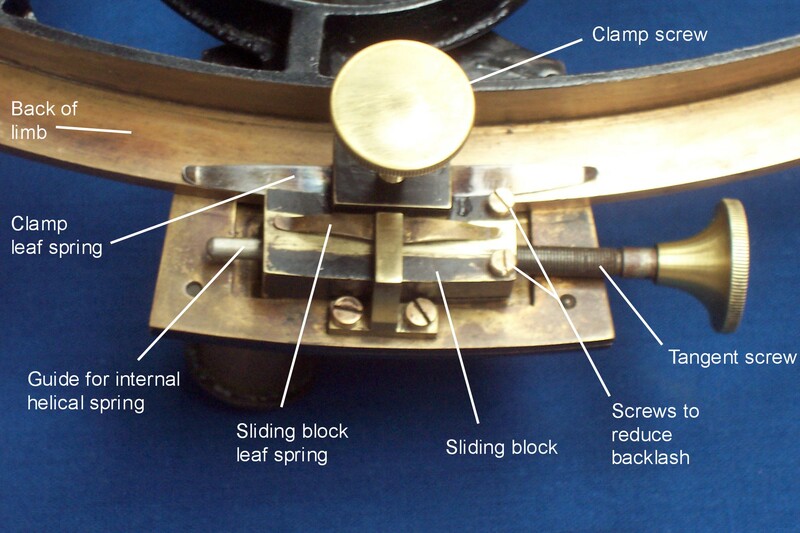 The micrometer mechanism was even simpler than that shown in Figure 12. There was no longer a swing arm. The worm shaft bearing rotated about a boss formed on its base and an arm extended down wards. 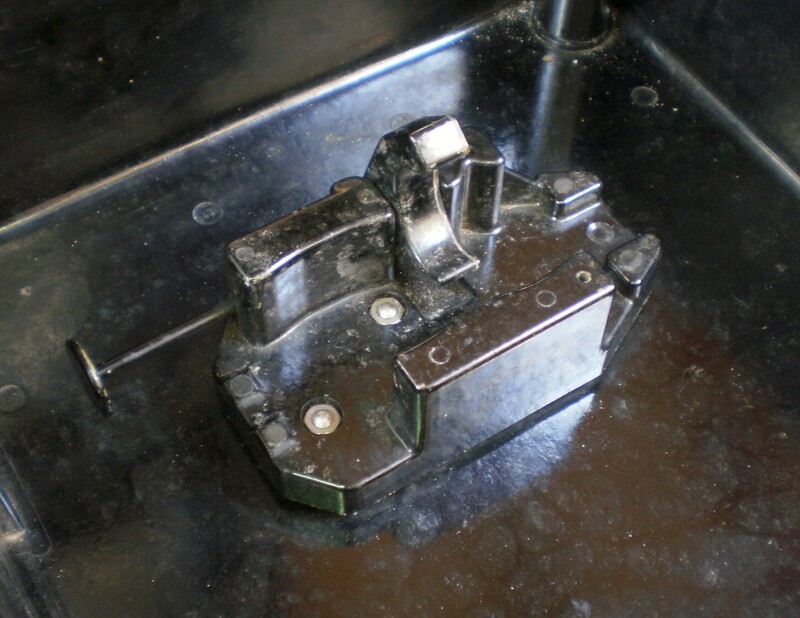 A spring at the end of the arm abutted against one wall of the plastic enclosure for the mechanism while a U-shaped wire link attached the arm to the release catch, which formed another wall of the enclosure made springy by slotting the base of the wall. Axial preload for the worm was provided by a spring clip (Figure 21). Figure 21: Micrometer mechanism of Navistar professional. The scales were illuminated by a system of light guides within the black plastic covering to the lower end of the index arm. The source of the light was simplicity itself, being simply a wire bulb-holder that also embraced the battery. An orange cap when depressed pushed the positive end of the battery against the central contact of the bulb and thus compeleted the circuit (Figure 22). A ridge on the cap latched against an internal cut-out to prevent the whole falling out, but slots cut in the cap to allow the ridge to spring into the cut-out had sharp corners which in my specimen have already led to a crack forming, and I anticipate having to machine a brass replacement some time in the future. Meanwhile, I have drilled a hole at the end of the crack to reduce stress concentration. The 4 x 40 Galilean telescope and its integral bracket were of high-impact plastic and there was no provision for servicing the internal surfaces of the lenses as both are cemented into place. 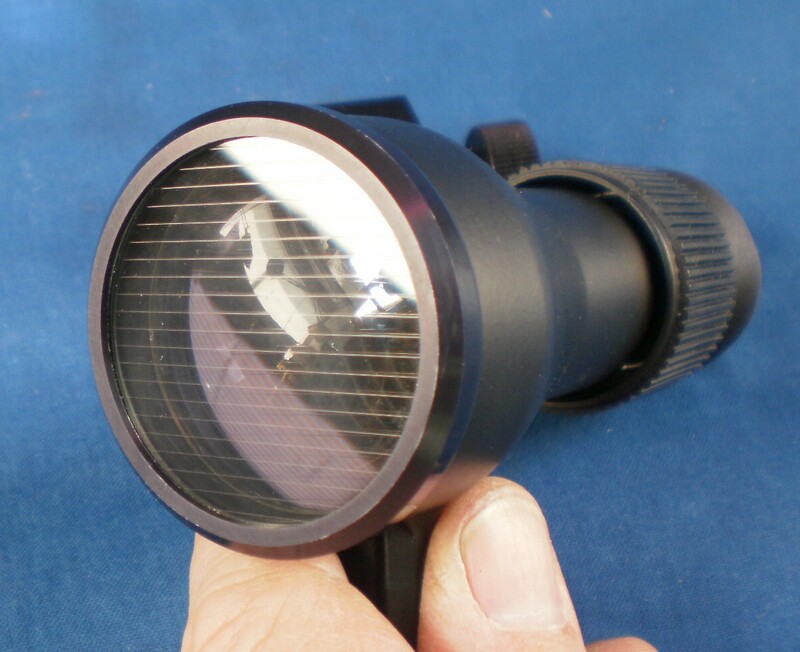 An interesting telescope could be supplied which has a front filter that allows normal viewing of extended sources but which acts as an astigmatiser for point sources (Figure 23). Almost needless to say, this filter cannot be removed for servicing of the lens beneath. The sextant is quite easy to use and is no doubt very rigid for its weight of 1600 G (3.5 lb), but the placing of the handle at 120 degrees means that when it is turned to view the micrometer drum it is out of balance. The telescope has a fairly limited field of view and the micrometer is difficult to read. Instrumental accuracy was given as better than 20 seconds. I doubt that this sextant found much favour with traditonalists, but by the time my specimen was sold (1988) sextants were already falling into disuse. If you enjoy reading about navigational instruments and technology of the sea, you will probably enjoy reading the book which gave rise to this web site, The Nautical Sextant as well as my more recent The Mariner’s Chronometer, both of which are available via the amazon web sites in North America and Europe. The Nautical Sextant is also available from the joint publishers, Paracay and Celestaire.